Concepts, Templates, Tools, and Resources! What is Social Impact Reporting? Social Impact Reporting is a communication strategy used to convey the change created by an organization or activity, and how that change was created. An impact report is not just a description of the stakeholder activities affecting the change because it also should include analyses about how much difference happened. Sharing your organization’s impact with stakeholders is not a linear process. It is more than sharing your inputs and outputs. The method of collecting, analyzing, and reporting information to internal and external stakeholders is critical to keep your organization on track to deliver impact. Communicating and learning from your data is as important as your organization’s frontline work. What makes an impact report effective? Effective impact reporting is a cyclical process that involves many stakeholders. Uniting the Impact Ecosystem: A Call for End-to-End Impact Management describes the entire impact ecosystem of players: Asset Owners, Asset Managers, and Assets. Is strategically designed for its intended audience. An effective impact report involves a step-by-step systems approach. And it is cyclical! Step 1: Setup the Lean Data Feedback System. Enterprises frequently collect feedback data in various forms depending on the relationship with their beneficiary. Data from rural beneficiaries come from simple offline tools and paper. Factory worker feedback data comes from SMS or survey apps. Larger organizations may use online data management systems such as Salesforce, a custom solution, or a proprietary application. 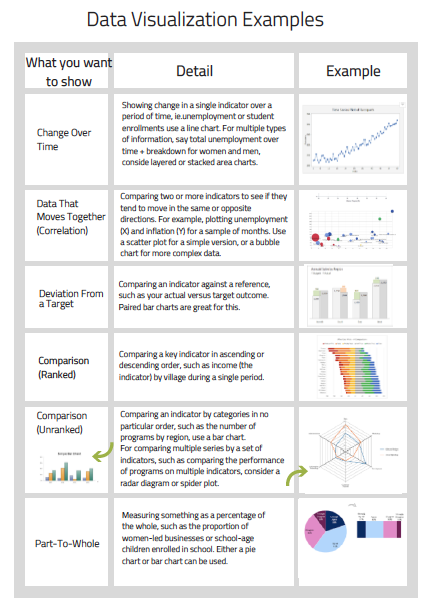 All of these methods can create data islands of Excel / Google Spreadsheets which cannot be easily reconciled and may lose integrity. More importantly, most enterprises cannot use data insights to make decisions about their product or services feedback. Impact Cloud Project Management provides a data warehouse solution. 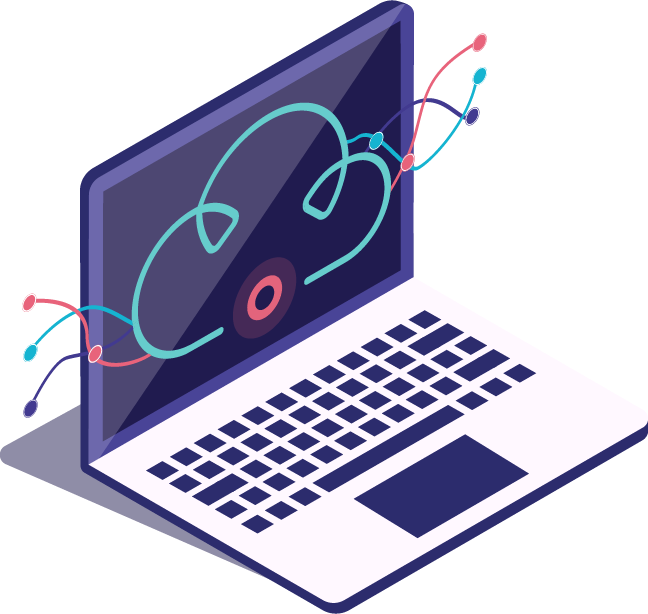 While data warehouse may sound like a complicated IT solution, unlike enterprise/corporate data warehouse this platforms, it is designed so that you do not have to be super tech savvy to use it. The project manager's innovative importing process enables offline aggregation, as well as SMS and online data both in non-real-time and real-time. The best part of this approach is that you are empowering assets (non-profits, social enterprise) to receive faster feedback. Another feature, Project Insight, uses advanced technology to find results from a beneficiary using qualitative and quantitative data analysis. It's a "Lean Data" approach which could potentially save organizations considerable time and investment. How can we speak uniform impact language from beneficiary to the asset owners? To start we have to align Outcomes & Metrics between the Asset Owner/Manager & Asset. When all the organizations are using the same system, metrics, and outcomes, setting up the system is even easier because the Asset Manager and Asset can easily provide different levels of access for story, outcome, and beneficiary data. Once metrics are shared with the Asset they can use simple formulas to calculate results year after year or for a specific reporting period. Depending on the relationship between them, Assets or Asset Managers can grant access to their data systems in order to see beneficiary, project portfolio, outcome or story results. 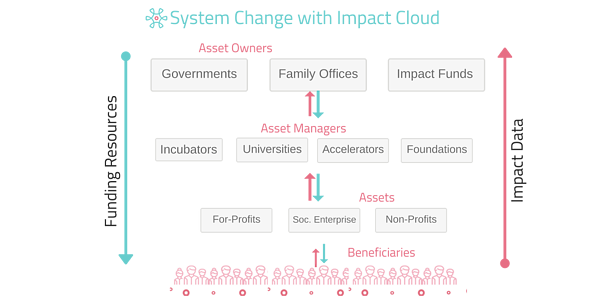 While funders (Asset Owners) must define their impact theses and impact frameworks (or Logical Frameworks), the real test remains in the alignment of similar core metrics between their investees, while also co-creating valuable social impact stories based on relevant outcomes and beneficiary insights. The impact report for Asset Owners and Asset Managers must align with the original impact thesis. Faster and real-time data flow between different ecosystem players forces better financial and social accountability downwards and creates a better trust between different players. Start with a good social impact report template specific to your target audience. Foundations: evaluate grant applicants and showcase grantee performance to board members and leadership. Non-profits: demonstrate your impact story to potential donors including evidence of social change. Impact Investors: evaluate the social impact of potential/previous investments. Alignment with a clear impact statement, impact thesis, theory of change or logic model, impact measurement methodology and key requirements by funders. The ideal impact report takes the reader (i.e. stakeholder) through the processes used to achieve the impact communicated in the report. This includes detailing things like an investment thesis, impact thesis, which metrics frameworks were used (e.g. Sustainable Development Goals, IRIS, etc. ), the outcomes achieved, and the path forward. The Executive Summary is perhaps the most critical section of the impact report. It should be written by your organization's leadership after you are confident of the impact story you want to tell. The summary should have a specific audience in mind and highlight part of your performance that matters most to them. It should attest that organization's leadership is standing by the information reported. Whether you are reporting on the overall work of your organization, a portfolio of investment, the effectiveness of a single initiative program, or social return on investment or funding, you should be guided by a strategy. Don’t make your stakeholders guess what that is, tell them! The impact goals you aim to meet along the way to achieving your vision can be expressed as outcomes or based on indicators. Outcome: What are the big issues that you are trying to move the needle on? These should clearly align with your mission and project goals. Additionally, you may choose to align with sectoral or global goals such as the Sustainable Development Goals (SDGs). Indicators: What performance gauges are on your dashboard to show how you’re tracking? Whether or not you publish them for external stakeholders, we recommend monitoring key social, financial and operational indicators throughout the year to ensure that you’re staying on track. Select perhaps five key indicators with three years of data to understand how much they typically vary. Data visualization helps users analyze information by making complex data more accessible, understandable and usable. 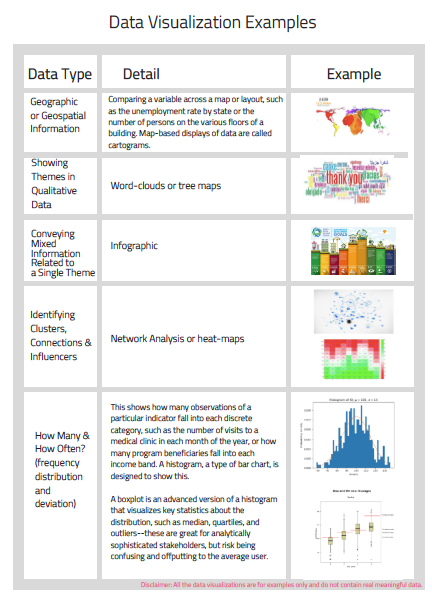 Think carefully about what you are trying to say with your data—what are they evidence of?— and choose an appropriate chart or graphic to show that. There are a number of underlying qualities which make for good impact reporting. Using these qualities to guide the creation of an impact report will ensure that the report serves its function and lends credibility to the activities being carried out to create change. It can be tempting to focus exclusively on the good news. Don’t. Think broadly to give a balanced picture of your organization's performance. Consider shorter- and longer-term horizons, governance, emerging issues and opportunities, and multiple points of view. When thinking about your organizational performance and impact, it is critical that you capture the perspective of your beneficiaries. Don’t just assume, ASK. For frankness and transparency, this can be through direct anonymous reporting, by electronic survey or on your website. Some simple approaches to capturing these include net promoter score (NPS) or progress out of poverty (Poverty Probability Index). Consider including the images, words, and stories of your beneficiaries in your external publications. 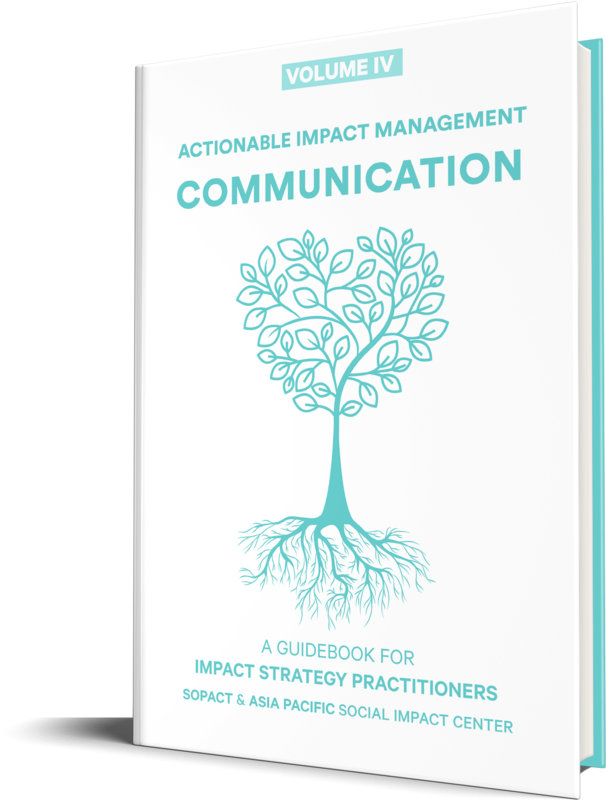 Impact communication is credible, or believable to stakeholders, when they are consistent, representative, and error-free. Your organization does not operate in a vacuum. Make sure that you have done your research and explained why each aspect of your change-making process was done a certain way, from Input data and Compilation Processes, to Information Outputs, and Engagement Processes. Impact information is more credible to stakeholders when it is consistent with data from other sources. Where appropriate, and especially if your findings are surprising, use external data for context. Maybe the improvement in health outcomes are consistent with dropping rates of HIV or malaria? Were changes in educational outcomes result of a state policy change? Was micro-lending affected by low international interest rates? One easy way to help ensure that your reporting is credible, balanced and comparable is to use an established reporting framework. A lot of thinking and stakeholder engagement has gone into creating these frameworks, which variously provide guidance on principles, subject matter, quality standards, and other measures to which you can align. As with adopting or aligning to standard metrics, using a respected and familiar framework can be an easy way to establish a shared frame of reference with your stakeholders. It also enables your impact performance to be easily understood and compared by stakeholders with a top-down or comparative perspective. The Sustainable development goals (SDG) are increasingly baked into prominent reporting frameworks, ensuring SDG alignment. For a primer on SDG-based reporting, please read “Aligning Impact Reporting to the Sustainable Development Goals”. 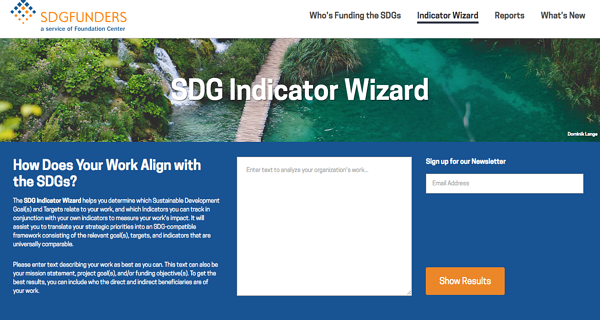 The SDG Indicator Wizard (pictured) is also a good place to start in order to begin to align with the SDGs. In recent years, frameworks that have been primarily developed with for-profit companies in mind are used for the social sector. GRI is the dominant corporate reporting framework for environmental and social issues. Similarly, the London Benchmarking Group recently rolled out LBG for Community, a simple input, output, impact framework for non-profits to use in reporting back to their corporate partners. It includes a set of guiding principles for practitioners across non-profit and corporate sectors responsible for negotiating impact measurement, reporting, and partnerships. Comparable impact information is provided in sufficient detail and in a format that enables users to match it to similar information across different organizations in an industry, and between years for the same organization. Comparability allows users to make decisions about the organization and choose between alternatives. Make your impact information easy to find for your stakeholders. For example, if they want to know how many respondents participated in a survey and how were they contacted, they should be able to find out. Good metadata also improves the credibility of your impact communication, because you are supplying stakeholders with sufficient information to make a critical assessment of the quality and representativeness of your impact information. Impact information is integrated with strategy when it clearly ties impact goals to organizational goals. 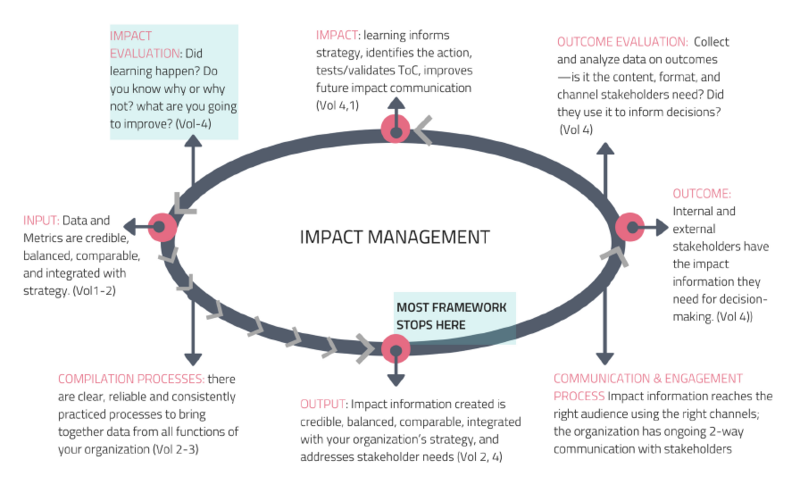 If your impact data collection has been driven by your vision, mission, and theory of change, it is hard for your impact communication to be anything other than integrated with strategy. 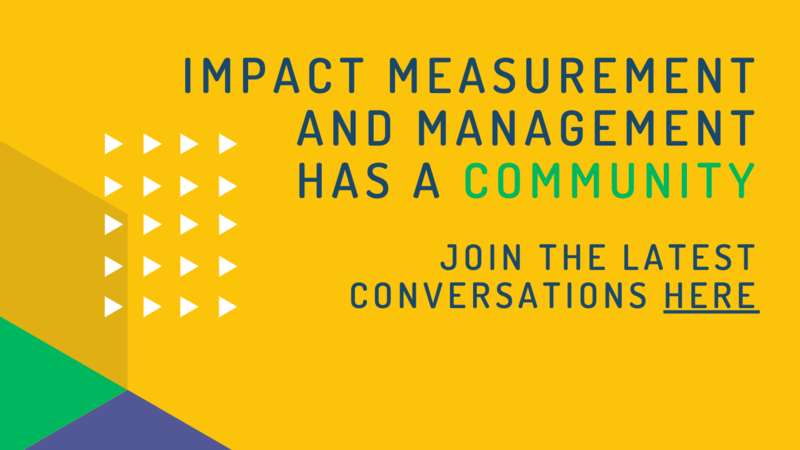 If you are starting impact measurement and reporting for an existing organization, your impact communication should reflect the organization’s larger strategy, and track progress toward the strategy. Organizational strategy drives choices about what data to collect and how to present information. The findings of your impact measurement informs and influences the strategic management of the overall organization. Communicating impact shouldn't be paragraph after paragraph of text. Images often speak more powerfully, especially to certain stakeholders. Visualizing your data and the results of your analyses can allow those insights to be more easily digested without losing their credibility or strength. With that said, keep in mind the following tips. Improper use of averages--do you want a mean or a median? Aligning reporting with Corporate Social Responsibility (CSR) methodologies can be made more efficient by using Global Reporting Initiative (GRI) standards to guide the process. When stakeholders are primarily in the corporate sector you'll have a greater need to align standards to a CSR or Sustainability focus. Case studies also provided by the GRI will be essential as foundational learning before creating CSR-aligned impact reports for the first time. There are a number of CSR certifications which may be useful for your organization and can help create further structure to the impact reporting process. One of the most well-established is the SA8000 Certification put forth originally by Social Accountability International. Other CSR accountability standards include the ISO 26000 Evaluation and those included in services provided by established organizations like Bureau Veritas. Read More: Why there is a shift in focus for better Sustainability Reporting? Non-profits often start their impact goals based on TOC or logic model based approach. The following table is a good starting point based on your target sub-sector. International Development agencies are often funded through combination of UN based agencies, or country specific agencies such as USAID, DFID or large foundations. While there is no clear impact framework, there is a results framework and reporting framework (IATI). These framework should not be equated with impact goals, but these are the closest approach. Impact Investors should focus on Impact Management project is developing a consensus based five dimensions help us all to understand our effects on people and planet. Still wondering how to build impactful reports? 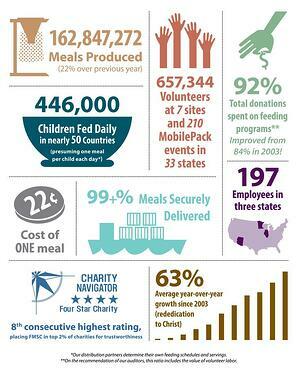 Look & Learn from the following impact reporting example. Demonstrating outcomes in education improvement for student beneficiaries, the Dream a Dream project. Follow the link above to learn how to the Dream a Dream project used a variety of data collection and analysis tools to acquire in depth outcome data for its impact reporting. .